Frustrated with your tomatoes dropping their blossoms? 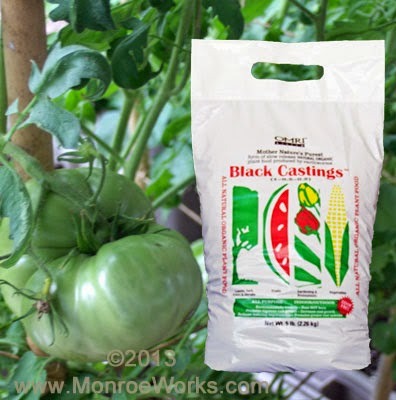 We heard recently from our friend Pappy who is using VermaPlex® and Pure Black Castings® to grow tomatoes for his hamburgers (cholesterol be d#%ed). Seems he's having a problem we once encountered with "blossom end rot " and "blossom drop " diseases on his prize tomato plants. So, I sez to myself "sounds like a great idea for an article". What is Blossom End Rot and Blossom Drop In Tomatoes? 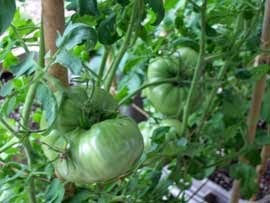 You've been tending those tomato plants since early spring: You planted the seeds; you transplanted a couple of times into larger containers; it finally got warm enough to put them in the ground or into your containers. You kept them watered and fertilized ,and you squashed (...or, like me, ate...) the tomato worms that inevitably showed up. You're finally rewarded with fruit that is ripening and turning red. You think you'll pick one and, lo and behold, on the bottom of the tomato or "blossom end", there's this large, black, sunken-in spot. What the .......? Or, perhaps, the plant filled up with blossoms - the promise of a future harvest sure to be abundant. You go out to water and what is that you see on the ground around the tomato plant? It's tomato blossoms! Falling off like snowflakes. And other blooms that managed to start making a little tomato are getting pinched on the end of the stem and the little buggers are ready to fall off, too. Some already have! Again, what the.....? These diseases afflicting tomatoes are serious, but, take heart, they are also preventable. What Causes Blossom End Rot and Blossom Drop in Tomatoes? Keep you soil ph between 6.2 and 6.8 and supplement your soil with , for instance, calcium carbonate. Don't fertilize your plants every time you water, which can be everyday here in Florida. Too much nitrogen causes insufficient calcium absorption by the plants. You may not be able to control the temperature. (Or the weather, for that matter. You know how it is, everybody talks about the weather, but nobody does anything about it.) What you can do is plant tomato varieties that do well in your area. If you're in the South, select varieties that are "heat tolerant". Northern gardeners shouldn't put out their plants too early in the spring. Wait until nighttime temps stay above 55 F/13 C, or protect them with a cover overnight. Another cause of blossom drop is lack of pollination. You may have to help them out by given them a shake or two if pollinating insects are scarce. Plant some nectar rich flowers near or in your garden to attract bees. As with blossom end rot, too much nitrogen can encourage too much foliage and not fruit. Add plentiful compost and/or worm castings or other slow release organic fertilizers when planting and inoculate with VermaPlex ®; add VermaPlex ® at 40:1 or even 80:1 every 7-14 days only thereafter. Like over-zealous fertilizing, stress also causes blossom drop. Lack of water will stress the plants, but since tomatoes have very deep roots, avoid shallow watering. It stresses and weakens the plant. In-ground plants should be deeply watered once a week during dry weather. Of course, your self-watering containers provide correct moisture constantly. As with the soil's moisture content, monitor and control pests and diseases as well to insure your tomato plants remain as stress free as possible. Remove any pests and treat for diseases as soon as you see evidence of them. Blossoms can also fall because the tomato plant just produced too many blossoms. They are competing for the nutrients supplied by the plant. You can make sure the plant has plenty of nutrients, as described above, but Mother Nature may still thin out an over-supply of blossoms. Try not to cry. Growing and Fertilizing Tomatoes How to plant and fertilize tomatoes using organic worm castings fertilizers. Composting Red Worms : Make your own organic fertilizer by vermi-composting (composting with earthworms).